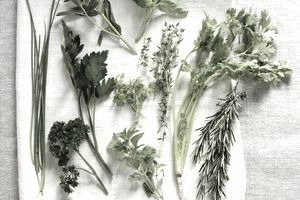 Are you tired of having fresh herbs go bad before you get around to using them? A simple change in how you store your herbs could make them last days -- or even weeks -- longer. Just follow these simple storage instructions. Trim the stems (just like you would a bouquet of flowers). Then, place the herbs in a vase or jar of cool water. Be sure to remove any leaves that fall below the water line (or they'll go bad quickly). Basil and mint do best at room temperature, so store these herbs on a sunny windowsill. For all other herbs listed above, the refrigerator is best. Cover your bouquet loosely with a plastic bag, and chill until you need it. To keep your herbs fresh for as long as possible, trim the stems and change the water every couple of days. Don't wash your herbs until you're ready to use them. This will keep them fresh much longer. Wrap your herbs in a damp paper towel or dish towel. Then, slide the towel into a plastic bag or storage container, and place the whole thing in the refrigerator. Re-moisten the paper towel as needed (you want it to be slightly damp, but not soggy). Wash your herbs just before you use them. Use the steps outlined above to store as much as you think you'll be able to use in the next week or so. Then, preserve the rest of your fresh herbs to enjoy later. Herbs are a cinch to dry. Just gather your herbs in small bundles; secure them with rubber bands; and hang them upside down in a warm, dry room. Allow them to dry for two to three weeks. Then, check on their progress. Your herbs are ready, when they feel dry to the touch, and crumble easily in your hand. If you want to speed up the drying process, you can also dry herbs in a dehydrator, a low-temp oven or a microwave. Just know that the flavor will be diminished slightly if you decide to go the microwave route. That's because microwaving robs the herbs of some of their oils. Store your dried herbs in an airtight container in your pantry. Be sure to shake the jar once a day for the first few days to evenly distribute any moisture that remains in the herbs. This will prevent them from molding, and ensure that they're ready for long-term storage. Here's how to substitute your dried herbs for the fresh herbs called for in recipes. Sturdier herbs (like basil, chives, oregano and rosemary) can be flash frozen whole. Just spread them out on a cookie sheet in a single layer, and pop them in the freezer. Once they're frozen, transfer the herbs to a freezer bag; label the bag; and return it to the freezer. If you plan to use your herbs finely minced, go ahead and do your chopping now. Then, pack the herbs into an ice cube tray, and top off the tray with olive oil or water, and freeze. Transfer the frozen cubes to a freezer bag, so they don't get freezer burned. Plan to use your herbs to make pesto? Then, go ahead and make it before you freezer them. The herbs will actually freeze better if you do. Just whip up your favorite pesto recipe, using basil or whichever herb you prefer, and pack it into an ice cube tray. Ice cube trays vary in size, but one cube should be the equivalent of about two tablespoons of fresh herbs. If you'll be using your herbs in cooked dishes, there's no need to thaw the cubes before you use them. Just add them directly to the pan; and they'll thaw as the dish cooks.Easy! Here are some tips to ensure your herbs don't become freezer burned.